When a stacked snow layer is broken by a retracting piston, the snow layer drops as a single "stacked top snow" item, not individual top snow item(s). One snow layer with visual effect of all the snow layers. 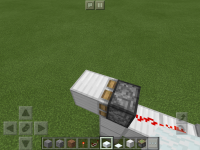 1) Extend a sticky piston sideways. 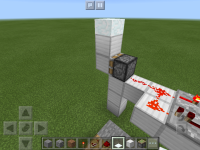 2) Place an iron block on the head of the piston. 3) Place a block on top of the piston head. 4) Place 2-7 top snow blocks on the block. 5) Rapidly retract and extend piston head. I used redstone. 6) While doing this, break the block from step 3. 7) If the snow layer falls on the piston head while it retracts, it produces a glitches snow layer item. Note: When placing this glitched item, it places a single snow layer.